Oh, what a beautiful day it will be when you present this bouquet to someone you love! 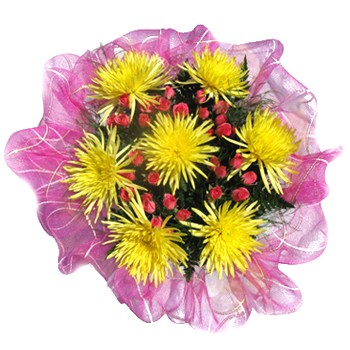 Delicate miniature pink roses are ensconced among vibrant yellow spider mums, accented with lush green foliage, and surrounded by a cloud of pink. Wish friends and family a Happy Easter, welcome someone to their new home, or tell them to Get Well Soon with the Beautiful Mornings Bouquet.